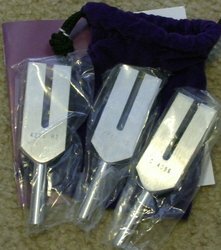 The 3-piece Angel Tuning Fork set is made of high quality aluminum and comes in a velvet pouch. The Angelic Tuning Forks are great to use with clients who are holding on to a lot of anger, worry, frustrations and/or pain as these fork will help the client to release these emotions from their physical body and aura. The Crystal Tuner, part of the 3pc Angel Tuning Fork Set, can be used to program your crystals and gemstones for use in the healing session. You can use these crystals as 'lasers,' to direct and increase the flow of energy. One method of how you can use your Angelic Tuning Fork with a crystal. With the person lying on a table, take a pointed crystal in your non dominant hand and the crystal tuner in your dominant hand. Strike the tuning fork and place the vibrating tip of the tuning fork on the crystal with the point of the crystal pointing towards the area on the client where you want to direct the energy. This works like a laser beam sending the frequency and vibration of the tuning fork and enhancing it through the crystal. You can direct the energy toward a specific spot, or area, on the person's body that needs it, or you can use it in the client's aura. This method can break up stagnant energy and blockages in the person's body. For more ideas and ways to use your crystal tuners, check out the information in the Tuning Fork Therapy® Level Three book available for purchase for $30.00 plus $4.99 postage. Cost $59.99 plust $6.99 postage inside the United States ONLY! To purchase the Biosonic Crystal Tuning Fork which is of slighly better quality than other tuning forks that I have tried on the market - click below. Cost of Biosonic Crystal Tuning Fork is $27.99 plus $6.99 postage. Biosonic Crystal Tuner Fork Set includes Biosonic Crystal Fork, black Hockey Puck, and 2" crystal point. Cost of set is $34.95 plus $6.99 postage. To learn more about how to use your Angel Tuning Fork set, you may want to purchase the Tuning Fork Therapy level three book. Cost of book only is $30 plus $4.99 postage in U.S.A.
Agape is the Greek word for 'unconditional love.' It is the most precious of all other types of love. This course includes a tiny manual with one symbol and one attunement. Angel Reiki combines the loving healing energy of Reiki with help from the Angelic realms.There are 4 angels that are included in this system. Raphael, Gabriel, Michael and Uriel. System includes ways to add an Angel to work with you and to connect to the loving and healing power of the angels. Angel Reiki can be used alone or with traditional Usui Reiki. There is one manual but three attunements. Cost of Course is $25 and includes emailed manual, 3 attunements and emailed certificate. The information for Aquamarine Dolphin Healing Ray was channeled by Carolynn Llyo in 2006. AQUARMARINE Dolphin Healing Ray is an emotional healing ray that connects you to the peaceful compassionate energy of the Dolphins. Using this system can restore balance and harmony very quickly, and due to its very gentle flow – it is suitable for all. There are no prerequisites to receiving this beautiful system although anyone who has had previous Dolphin attunements such as Dolphin Reiki may find that the Dolphin connection is particularly enhanced. AQUAMARINE Dolphin Healing Ray works with past, present and future emotional issues. You can use this energy to work with other healing modalities and Reiki forms, as well as crystals – particularly Aquamarine! There are no prequisites for this course. Manual, attunement and certificate will be emailed to you. This system has no symbols. Use this system for personal transformation and spiritual growth. The Atlantian Crystal will appear differently to each student so be prepared to see the crystal in s different color and shape. Manual, attunement and certificate will emailed to you.